“June 1863 Gettysburg Campaign. Fairfax Court House, Virginia. Capt. J.B. Howard, Office of Assistant Quartermaster, and group at headquarters, Army of the Potomac.” Wet plate glass negative by Timothy H. O’Sullivan. View full size. This entry was posted in Archive, Feedbin and tagged Favourite, Feedbin, Shorpy Historical Photo Archive - Vintage Fine Art Prints on 30/05/2014 by John. January 11, 1941. “Triboro Hospital for Tuberculosis, Parsons Boulevard, Jamaica, Queens, New York. X-Ray viewing room. Eggers & Higgins, architect.” Large-format acetate negative by Gottscho-Schleisner. View full size. Johnny Cash in 1968, near the Arkansas farm where he grew up. Going to Memphis, no doubt. From photos by Joel Baldwin for the Look magazine assignment “The Restless Ballad of Johnny Cash.” View full size. This entry was posted in Archive, Feedbin and tagged Favourite, Feedbin, Shorpy Historical Photo Archive - Vintage Fine Art Prints on 13/05/2014 by John. New York, 1917. 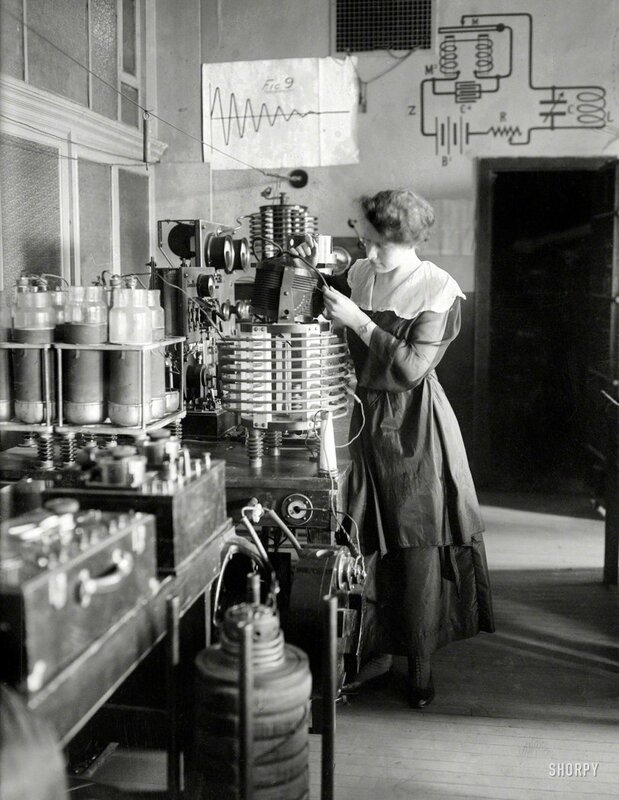 “Helen Campbell.” A Hunter College student licensed as a wireless operator during World War I. Bain News Service. View full size. This entry was posted in Archive, Feedbin and tagged Favourite, Feedbin, Shorpy Historical Photo Archive - Vintage Fine Art Prints on 01/05/2014 by John. 1864. “Point of Rocks, Virginia (vicinity). 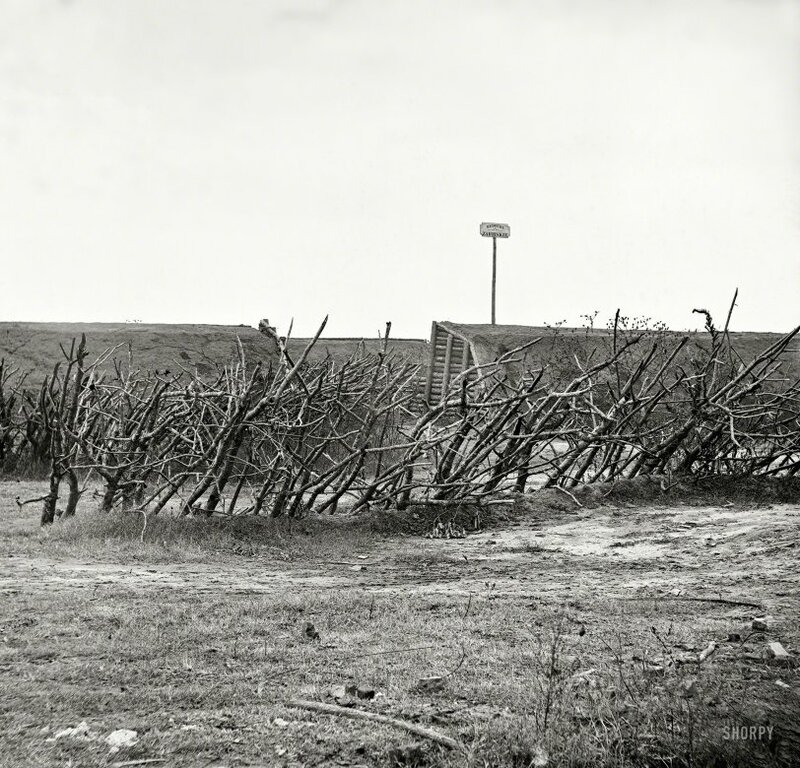 Redoubt ‘Zabriskie’ on Appomattox River.” Civil War glass negative collection, Library of Congress. View full size. This entry was posted in Archive, Feedbin and tagged Favourite, Feedbin, Shorpy Historical Photo Archive - Vintage Fine Art Prints on 22/04/2014 by John. October 1942. 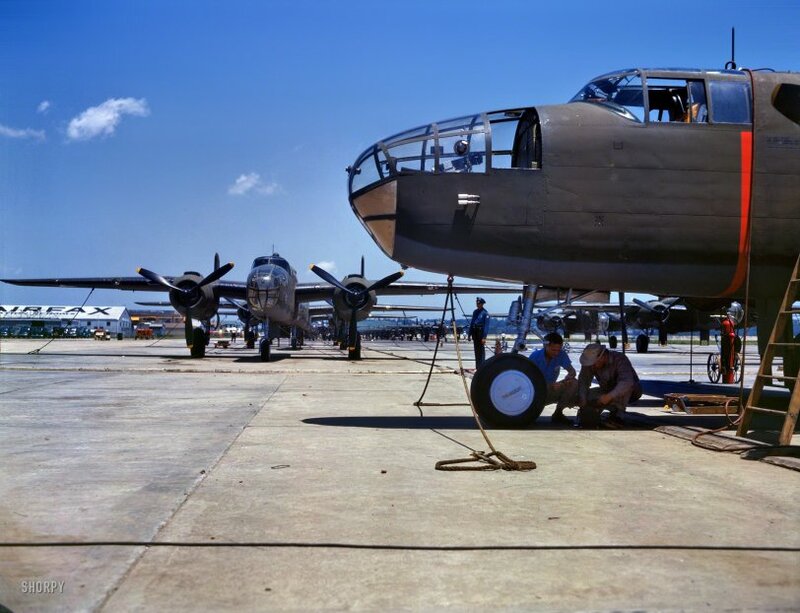 “New B-25 bombers lined up for final inspection and tests at the North American Aviation plant in Kansas City, Kansas.” 4×5 Kodachrome transparency by Alfred Palmer for the Office of War Information. View full size. Washington, D.C., circa 1920. 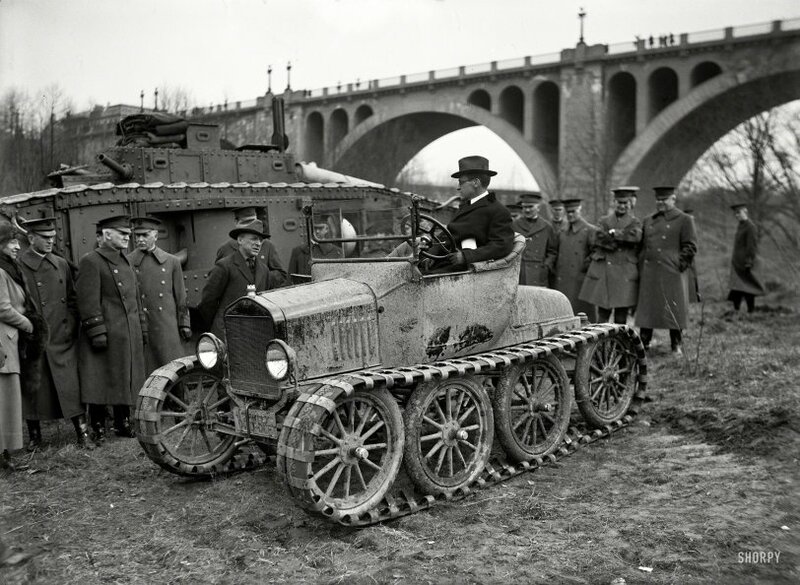 “Army car with Key Bridge in background.” A sort of Model T on steroids. Harris & Ewing Collection glass negative. View full size. 1864. “Point of Rocks, Va. (vicinity). 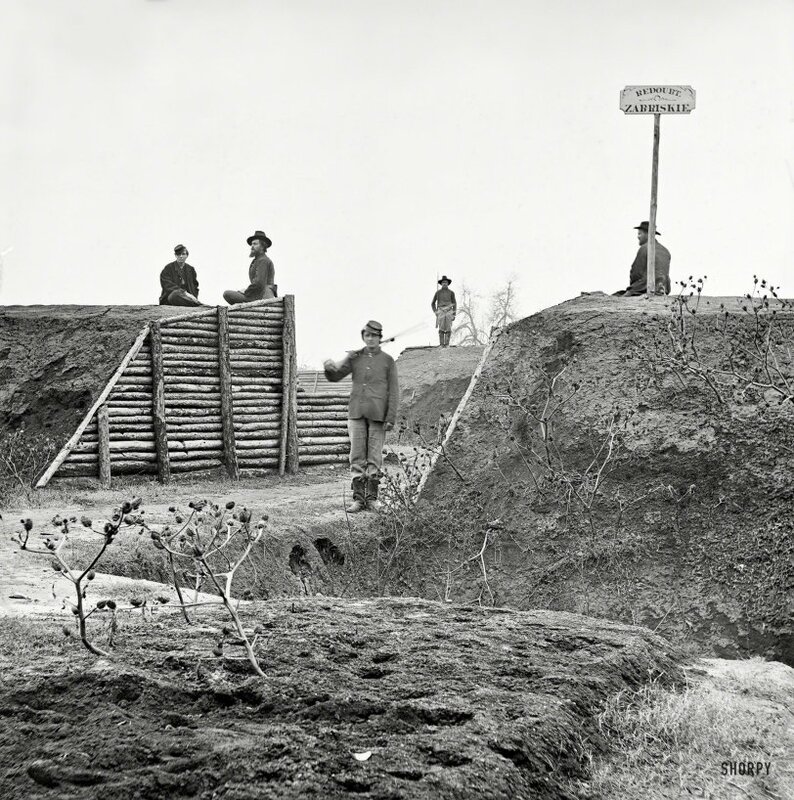 Redoubt Zabriskie on Appomattox River.” Wet plate negative, Library of Congress Civil War Collection. View full size. This entry was posted in Archive, Feedbin and tagged Favourite, Feedbin, Shorpy Historical Photo Archive - Vintage Fine Art Prints on 15/04/2014 by John. Washington, D.C., 1922. 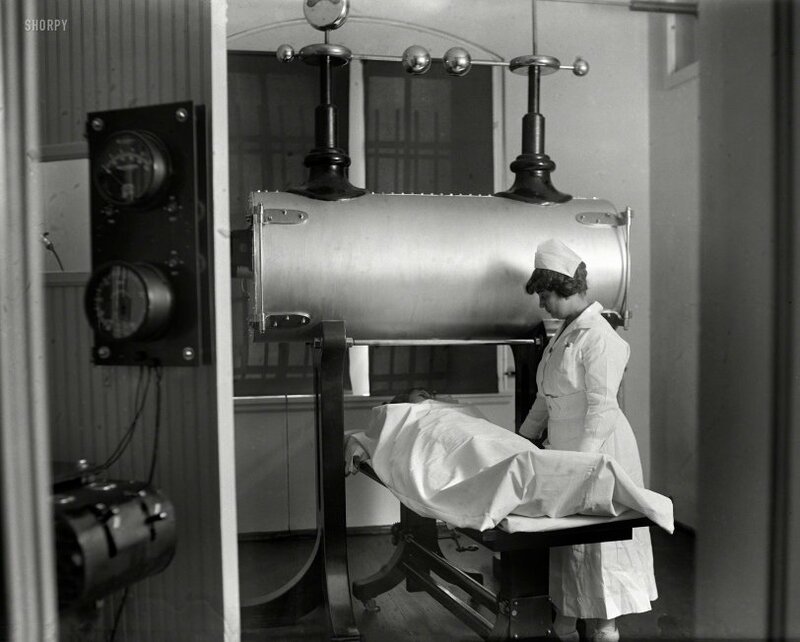 “X-ray at Garfield Hospital.” We’ll have you patched up in no time, kiddo. Harris & Ewing Collection glass negative. View full size. This entry was posted in Archive, Feedbin and tagged Favourite, Feedbin, Shorpy Historical Photo Archive - Vintage Fine Art Prints on 31/03/2014 by John. April 1953. Washington, D.C. “Sen. 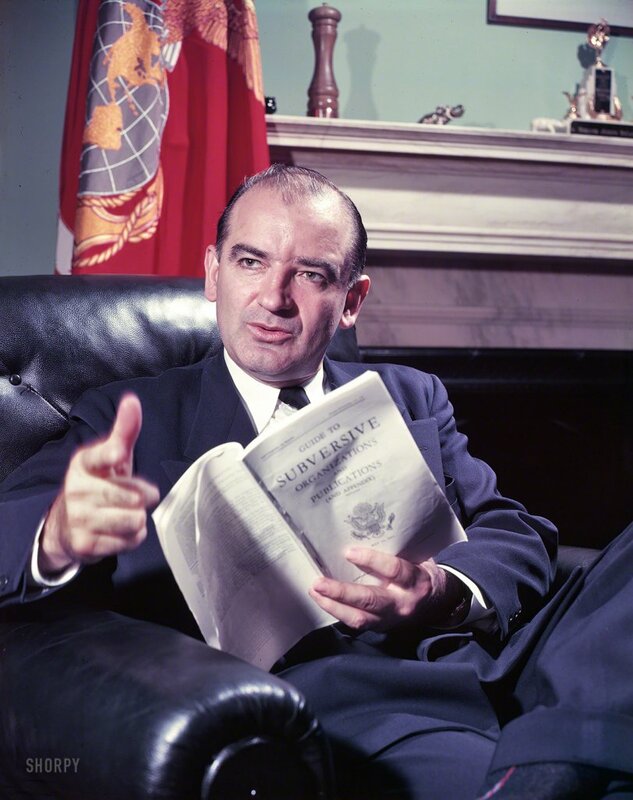 Joseph McCarthy of Wisconsin.” Kodachrome by Frank Bauman for the Look magazine assignment “Joe McCarthy: The Man With the Power.” Not to mention what looks like a pepper mill. View full size. This entry was posted in Archive, Feedbin and tagged Favourite, Feedbin, Shorpy Historical Photo Archive - Vintage Fine Art Prints on 18/02/2014 by John.